Each week during 40 Days of Opera, check back on the BLO blog for a new installment of this in-depth history of BLO! At the end of Part II, Janice Mancini Del Sesto assumed the position of General Manager of BLO; she would hold the leadership position at the Company for 16 years. Over a weekend of perfect weather in September of 2002, a reported 140,000 people enjoyed Carmen on the Common, celebrating BLO’s 25th Anniversary Season. Janice Mancini Del Sesto brought to BLO a unique set of credentials. A graduate of New England Conservatory with a degree in voice and music education she had trained and briefly toured with Boris Goldovsky. After completing a master’s degree in education she had taught voice and mentored students. Her work with non-profits and arts organizations had included positions as the first director of development and communications of the New England Foundation for the Arts and as the head of development and communications at the Computer Museum. She was presiding over her own arts development consulting firm when she first became connected with BLO. In addition to her many qualifications for the position she was a Rhode Islander, a New England native who had a thorough first-hand knowledge of the operatic ups and downs of Boston’s recent musical past. She was as prepared as anyone could be for the situation she stepped into, just before the beginning of the 1992-1993 season. Despite Hod Irvine’s efforts to create harmony, Del Sesto faced a still-fragmented opera-going public as well as what continued to be a multi-voiced Board of Directors. Within the community there were enduring factions that believed it unwise to count Sarah Caldwell out and that indeed thought she might be engaged by BLO as a stage director; another group continued to support the idea of the Craig Smith/Peter Sellars team for BLO’s artistic leadership positions; yet another resisted as strongly as ever the belief that BLO could rise to a status higher than that of a modest municipal undertaking. Within the Board the fault lines fell roughly along the divide between the old guard and the new guard, the former consisting largely of traditionally hands-on founding members who sought to continue their direct involvement with artistic decisions, and the latter encompassing newly recruited former BOT and OCB supporters and a significant influx of members from the business community recruited by Irvine, who focused on actively seeking to broaden support for the Company within the funding community. The personality differences and competing artistic agendas that had made the BLO/BOT Board negotiations so complex re-emerged in this context. BLO was suffering from institutional growing pains and reinventing itself once again. Del Sesto’s initial accomplishments in her new role would take place largely behind the scenes as she worked to build some consensus about mission and company identity. During Del Sesto’s term of company leadership beginning as General Manager in 1992 then continuing as General Director from 1995 to 2008, BLO would successfully weather all these and other storms as they arose and would grow in every measurable way. Her tenure would see the increase of BLO’s annual operating expenses from 1.2 million to over 6 million dollars, the move to a much larger theater, the implementation of a widely praised business model, and the accomplishment of many BLO and industry firsts. The Company would evolve more fully as a board driven organization and would recommit to its roots as a “Boston” institution. Its major artistic successes would feature new stars and present emerging artists in addition to well-established singers, important stage directors and talented conductors. Its performances would be enjoyed by enthusiastic attendees of annually increasing numbers and by a large New England-wide radio broadcast audience. Taking charge at the beginning of the 1992-1993 season Del Sesto elected to continue some of the successful practices of the Moss era, such as borrowing and renting productions from the Opera Theater of St. Louis and collaborating with them on programming and casting. She and Board Chair Hod Irvine and J.P. Barger after him reiterated their promise to aim for the highest artistic levels of regional opera. But the time had come to make strides in new directions. BLO sought to clarify its mission and more clearly delineate its identity before its public. Would sustained close interaction with St. Louis not raise the risk of making BLO appear to be a mere reflection of the other company? After all, both organizations had been focused on presenting new talent in the same catalog of works that falls within the reach of regional companies, and their productions often had the same “look.” How might BLO distinguish its image and its goals from those of the other company? Del Sesto described in published interviews the important role that aggressive fund-raising would need to play in the future in order to enable the Company to draw new resources and expand the community of funders committed to it. The results, she rightly foresaw, would be the increased ability of BLO to take a lead role in collaborating with other opera companies and to build networks with other institutions within the city of Boston. These two points along with a new casting focus would be key in formulating a brighter, more sharply defined image for BLO. Going forward, then, the practice of borrowing and renting productions was retained but with several modifications: the works of companies in addition to St. Louis were utilized; BLO took an active role in co-producing increasing numbers of works with other companies; and some of BLO’s original productions were sought for rental by others, providing a new source of income. Some of the collaborations were international in scope, a new wrinkle for this regional company, hinting at the possibility of future growth beyond the range of regional opera. This fulfilled the first promise of Del Sesto’s expanded fund raising efforts aimed at creating a new image for the Company. The focus on community engagement that had been championed by Anne Ewers was notably strengthened and deepened by Janice Del Sesto, again as she had promised, this time underlining but also expanding the definition of what it means to be a “Boston” company. With Del Sesto’s guidance BLO forged a major community partnership with WGBH public radio. Beginning with its Carmen, aired in February, 1994, BLO’s performances were broadcast throughout New England to large and very appreciative audiences. Other community partnerships brought free operatic performances to great numbers of people, including a series of programs entitled Opera Night at the Boston Public Library and outdoor concerts presented with the Boston Pops Orchestra on the Esplanade and the city of Boston’s Waterfront Performing Arts organization in Christopher Columbus Park in the North End. Under this model being a “Boston” company included disseminating opera more broadly within the community than ever before. Del Sesto’s BLO created themed seasons, selecting an element common to all the works programmed for a given season and devising a title to highlight that motif. The most noteworthy of these were the 1999-2000 “Egyptian Season” and the 2004-2005 season, “Flights of Fancy.” Each one featured an elaborate network of citywide partnerships with other institutions such as the Museum of Fine Arts, the Museum of Science, the Boston Ballet, the Wang Center for the Performing Arts, and the French Library/Alliance Française, all promoting an expanded experience of the given topic. The participants developed ticket packages and travel agencies promoted themed tours, to the considerable economic benefit of the city. The centerpiece of the “Egyptian Season,” Akhnaten, and the corresponding exhibit presented by the Museum of Fine Arts entitled Pharaohs of the Sun, then moved in tandem to the city of Chicago, to Chicago Opera Theater and the Art Institute of Chicago, respectively. Such an intra-city collaboration combined with the inter-city connections was historically unique in its scope, as was the attempt to create such an enriched context in which to view opera. Despite the fact that the City of Boston offered very little financial support to the effort, the success of the collaboration spurred the Mayor of the City of Boston, Thomas M. Menino, to convene with the Greater Boston Chamber of Commerce at the University of Massachusetts/Boston Campus to discuss the topic of building an arts industry and developing cultural tourism in Boston. Del Sesto’s expanded fund raising efforts and her concepts of networking and collaboration eventually intersected and led to quite a different kind of partnership within the community. Beginning with the 1997-1998 season, the name of a given sponsor began to appear in the printed program directly beneath the name of the artist whose performance their contribution supported. The practice demonstrated to the public at large how important donors are to the production of opera, and for some artists and sponsors the linking of their names in this fashion led to an enduring personal bond. Having been among the earliest companies to adopt this practice, BLO has quite successfully continued it into the present era, and the practice has since been emulated by other companies. Besides extending and expanding the collaborations with other regional companies, as begun by Justin Moss, and networking within the community, as initiated by Anne Ewers, the Del Sesto-led BLO followed up and built upon other programming trends established by Moss and his team. As previously noted, the Moss-era 1992 premiere of the new Michael Kaye critical edition of The Tales of Hoffmann had been a very significant achievement for BLO, and Kaye’s onsite work with the Company attracted international attention. This interest in alternate versions of familiar works continued under Del Sesto with such productions as the 1994 American premiere of the Neapolitan version of I Puritani; in 2001 the original five-act French version of Don Carlo; and in 2005 the French version of Lucia di Lammermoor, last presented in the United States over a century before. Moss had successfully programmed some less familiar and seldom seen works by well-known composers, such as Rossini’s La Cenerentola in 1991. A similar approach worked well for Del Sesto with works such as Berlioz’s Beatrice and Benedict in 1993, Handel’s Xerxes in 1996, Mozart’s The Shepherd King in 1997, and Strauss’s Salome in 2001. By the mid-1990s it had become clear that BLO was the primary opera company in Boston, and many in the community began to acknowledge and value the fact that it was being professionally governed and effectively managed. As the economy of the times brightened, BLO saw a surge of growth in ticket and subscription sales and in the number of donors and the size of their gifts. Regularly selling out the house, BLO responded to the demand for tickets by increasing the number of performances of each opera, and for the 1998-1999 season it made a major move – out of the Emerson Majestic Theatre and into the Shubert Theatre. The move to the Shubert opened up many opportunities for BLO, with the new venue’s seating capacity of 1,550, nearly doubling the Majestic’s 850, and its orchestra pit accommodating 67 musicians greatly improving upon the 39 places at the Majestic. Now larger scaled operas could be presented; co-productions with a wider range of partners became possible; and of course much larger audiences could be served. Given the greater availability of the Shubert over the Majestic, Del Sesto predicted that the Company would be able to add an additional opera to each season within a few years and possibly another in the years to follow, allowing for more diverse programming. The year 1998 was a banner growth year for BLO in other ways as well. The Company named Leon Major as its Artistic Director, the first person to hold that title since the departure of John Balme in 1989. The Toronto-born Major, who had directed BLO’s successful L’Elisir d’Amore in 1997, was a well-respected opera and theater director then serving as Director of a new opera program at the University of Maryland, and he brought teaching skills as well as directorial experience with him to Boston. The theatrical and technical aspects of BLO productions were to be his responsibility in complement to Stephen Lord’s ongoing work as Music Director, an arrangement that contributed greatly to the Company’s artistic development over the next five years. In another move, BLO made a very large and significant commitment to opera education during the same year when it acquired Opera New England (ONE). Begun in 1973 as the touring arm of Sarah Caldwell’s Opera Company of Boston, it had become an entity separate from the financially failing OCB in 1988 and then had reoriented itself toward presenting opera exclusively to children in 1989. It had operated independently for many years, until its founder and artistic director, Linda Cabot Black, determined that it could be more efficiently managed as a BLO affiliate. In February of 1998 BLO announced its legal acquisition of ONE, assets and liabilities included, thence to become the Company’s Education and Community Programs Division. With the new millennium approaching and anticipating sustained growth, BLO began to refocus its casting strategies, even as it continued to develop new and expanded collaborations. As do many regional companies it had been seeking out young talent worthy of showcasing, hoping to discover future stars and to attract audiences with the exciting possibility of being present at the making of operatic history; and it had actively sought to engage and support artists of diverse racial and ethnic backgrounds with the intention of reflecting the diversity of the city, another facet of its identification with Boston. In support of its casting strategies the Company had already initiated a series of “Corporate Night at the Opera” events during the 1996-1997 season to raise funds for the development of emerging artists. Without neglecting this aspect of its casting strategy BLO began to seek out new stars, artists who were already complete in their vocal technique and acting skills and who were prepared to move to the next level of their careers. Del Sesto spoke of the importance of seeing an accomplished artist develop a new role and present it for the first time. And indeed many of the artists thus featured by BLO were mere steps away from major recognition and career activity at a level well above regional opera. BLO kept track of some of these new stars and presented progress reports to its audiences, such as those in its Playbills of the 2001-2002 season. By now the sights of the Company were clearly set on a much higher level of scale, no longer on regional opera status but national status. In 2001 Chairman of the Board of Directors, Sherif Nada, suggested a comparison with important U.S. companies when he observed that even with the increased seating capacity of the Shubert Theatre over the Majestic, BLO’s performance venue was still only 1/3 to 1/2 the size of those of companies such as San Francisco, Miami, New York City Opera, Chicago, Houston, and Washington. Further, observing its 25th anniversary that year, BLO was nevertheless decades younger than those other companies. However BLO was growing in a way that could make it competitive with these companies, he noted, having moved in the preceding decade from 64th out of 95 U.S. companies, as measured by budget size, to 15th out of 115. As Del Sesto had predicted, the Company added a fourth opera to its subscription series for the 2000-2001 season, a sure indicator of the kind of growth Nada had described. 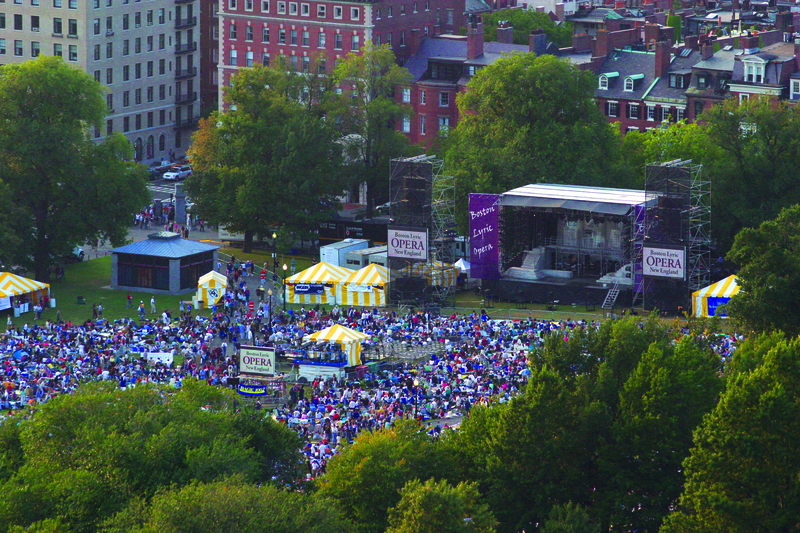 BLO celebrated its 25th anniversary by closing the season with a gift to the city of Boston, two free outdoor performances of Carmen on Boston Common in September of 2002. On a weekend of perfectly clear skies and mild temperatures, crowds in lawn chairs and on blankets on the grass, more than 140,000 people in all, enjoyed the multimedia production as it unfolded live onstage and was simultaneously projected onto giant screens flanking the stage, supplemented by an elaborate sound system. Over the course of the summer BLO had distributed free study guides in multiple languages within the community, and an array of cultural organizations had partnered with BLO to provide neighborhood-based educational previews for all ages. Carmen on the Common, as the event was dubbed, was widely praised and recognized for excellence, garnering acknowledgments and awards from the Boston City Council, the Arts and Business Council of Greater Boston, and OPERA America. During the 1990s BLO had undergone rapid expansion, trying to provide enough tickets to its performances to satisfy the ever-growing demand for them, working to raise funds to expand its operation as well as to extend its seasons. For the 2000-2001 season a fourth production and two non-subscription performances of each opera had been added, and the following season saw the addition of a seventh series. The Company had expected at the time to continue adding performances incrementally over the next five years, but the rapid and steady growth of the ʼ90s could not be sustained indefinitely. Multiple changes in both local and national life intruded, and the first decade of the new century would prove quite unlike the last decade of the previous century. Next week, in Part IV, BLO enters into the 21st century amidst a rapidly changing arts landscape in Boston and nationwide. The New England Foundation for the Arts is a regional organization founded in 1976 with funding from the National Endowment for the Arts for the purpose of strengthening the infrastructure of the arts. The Computer Museum was founded in 1982 and opened on Museum Wharf in 1984, then merged with the Boston Museum of Science in 1999. Preceding the 1993-1994 season BLO created a new category of support, the Board of Overseers, as a complement to its Board of Directors, providing a means of drawing in individuals who were considering a larger commitment to the Company. The Company also issued a revised mission statement, one that included the goal of ensuring the continuation of professionally produced opera in Boston, an insertion important to many of the former BOT Board members who were now part of BLO. However BLO did not adopt the Opera Theater of St. Louis practice of performing all works in English and has presented many, although not all, works in their original language. Del Sesto described the value of co-productions to regional opera companies thus: “They allow us to share both artistic ideas and costs of developing new and exciting productions for our audiences….., productions that no single company could afford to produce on its own,” from the General Director’s notes, Playbill for Boston Lyric Opera’s production of The Abduction from the Seraglio, music by Wolfgang Amadeus Mozart, libretto by Gottlieb Stephanie the Younger after the play by Christoph Friedrich Bretzner, set by John André, performed November 6, 8, 10, 12, 15, 17, 19, 2002, at the Shubert Theatre. Aïda, music by Giuseppe Verdi, libretto by Antonio Ghislanzoni, performed November 10, 12, 14, 16, 19, 21, 1999, at the Shubert Theatre; Akhnaten, music by Philip Glass, libretto by Glass in association with Shalom Goldman, Robert Israel, Richard Ridell, and Jerome Robbins, performed January 26, 28, 30 February 1, 4, 6, 2000, at the Shubert Theatre; Die Zauberflöte, see note 67. Chairman’s message, Playbill for Boston Lyric Opera’s production of Aïda; see note 75. BLO received the OPERA America Success Award for unprecedented collaboration, according to the Boston Lyric Opera 2008-2009 Fact Sheet. See note 48 for Kaye critical edition of The Tales of Hoffmann. The Shubert Theatre opened in 1910 as a venue for stage shows and opera. It was placed on the list of the National Register of Historic Places in 1980. Closed for renovations for several years, it reopened in 1996. “Lyric gets new home, renewed commitment,” by Richard Dyer, op cit. Previously Sarah Caldwell had created a touring company called the American National Opera Company, (see “Hub May Not See Operas of New National Troupe”, by Elliot Norton, the Boston Record American, April 12, 1967, p.49), which only lasted a season or two. Its route was to cover cities which had earlier been served by the National Company of the Metropolitan Opera, an entity featuring young singers, disbanded after a brief run because of financial considerations. The productions to be presented by Caldwell were to be created and rehearsed in Boston but were not intended to be performed there, a strange presaging of the circumstances which had factored into the formation of the short-lived Canon/Smith/Sellars Boston Opera Theater. Those named included David Daniels, Mary Dunleavy, Paul Groves, Nathan Gunn, Lorraine Hunt Lieberson, Earle Patriarco, Patricia Racette, Lisa Saffer, Robert Spano, Deborah Voigt, and Stephen West, p. 36 of Boston Lyric Opera Playbill for La Bohème, music by Giacomo Puccini, libretto by Giuseppe Giacosa and Luigi Illica, based on Henri Murger’s Scènes de la vie de bohème, performed May 1, 3, 5, 7, 10, 12, 14, 17, 2002, at the Shubert Theatre. There would be many other such new stars in the seasons to come. Cultural partners for this event included the Boston Symphony Orchestra, the Boston Public Library, the Children’s Museum, the Huntington Theatre Company, the Wang Center’s Suskind Young at Arts program, WGBH public radio, Young Audiences of Massachusetts.